After months of popping the sweetest little tomatoes off the vine we are amazed to still have such an abundance. 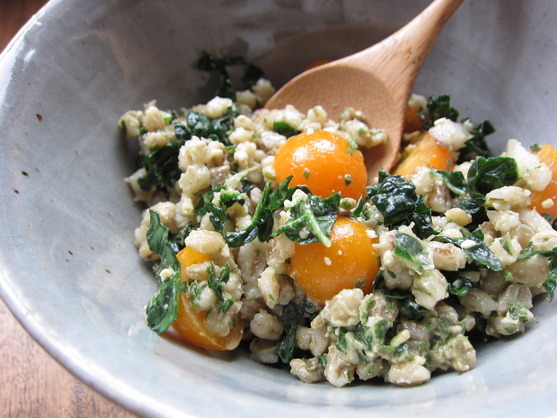 This vegan grain salad is a reflection of my earnest attempts to get these tomatoes eaten in another creative way. Truly, we've been popping them like grapes but it was time to dress them up rather than cook them down in a frittata. Take advantage of the last remaining weeks of fresh tomatoes and basil coupled with the heartiness of a cooler crop like lacinato kale. Sunsugar are an heirloom variety well suited for urban gardening. Don't fret if you can't find them, just swap it with another fave.